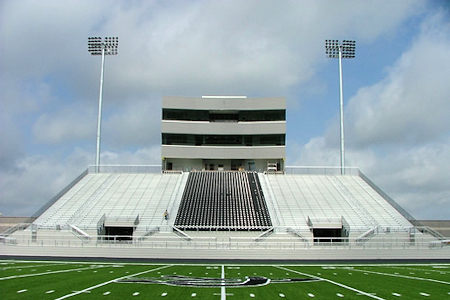 Located at the gateway to East Texas from the DFW Metroplex, Royse City ISD Stadiums uniquely accessible location, amenities and size have made it a popular playoff location for many area school districts. With 1200 armed backed chairs in the reserved seating area, fans can enjoy the game with a video scoreboard that includes instant replay and popular computer graphic designs. The eight lane track that surrounds the playing surface is also equipped with the latest electronic timing features.